Posted on 10/08/2014National Walk to School Day! Why is Wearing a Bicycle Helmet Essential? Most avid riders wear a helmet but those who are more of a recreational rider seem to be the ones that don't perhaps because they don't know the consequences. If you ride a bicycle, you need to wear a helmet – it’s that simple! Florida law requires kids under the age of fifteen to wear helmets. But, it doesn’t stop there. A bike helmet must be fitted properly. The difference between a helmet fitting and not fitting is subtle, but dramatic. A child riding with a helmet pitched back on their head or with their chin strap unbuckled is only slightly better off than if not wearing one at all. 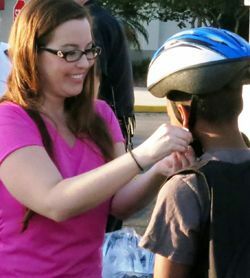 As a result of our involvement with All Children’s Hospital, FDOT and other community partners, Kati Jones, Community Outreach Director at Jim Dodson Law, recently completed the training to become a certified bike helmet fitter. Kati joined twenty people from Pinellas County police agencies and emergency services for the training which was held at St. Anthony’s Outpatient Center, in Clearwater. 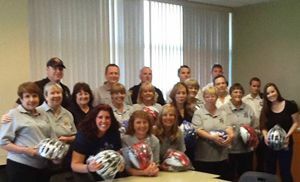 “ We are able to reach a lot of kids to reinforce bike safety through our annual “Bike for Kids Program,” our “Helmets for Kids Program,” participation in school bike rodeos, Bike to School day and numerous other activities with our bike club affiliations. Kati’s certification allows us to professionally fit children with helmets and teach them a lesson about safety that could literally save their lives,” Jim Dodson said.